This mousse appeared in my 2012 favourites video and with good reason as it's a great way to give your hair long lasting beach babe waves and curls without heat or making your hair feel heavy with product. I buy mini bottles of this as I like to carry it in my handbag which means I repurchase it quite a lot, but when it makes my hands smell of marshmallows who can blame me! It's only £2.50 too so doesn't break the bank. A firm favourite of mine since my first year of uni, this has to be the most long lasting and easy to apply eyeliner I've tried to date. I'm quite tempted to purchase the brown version too for more natural looks. It was only January when this little wonder product came into my life, but there's no way I'm letting it go anywhere as after putting it in my routine my skin is better than it ever has been (touching lots of wood here). What's on your Sunday shopping list? I'm back at uni now after seeing the amazing hotness that is One Direction last night at the O2! Needless to say my throat is sore from all the screaming, but I'm looking forward to recovering tonight during a nice chilled out evening with my house mates and a glass of Prosecco. 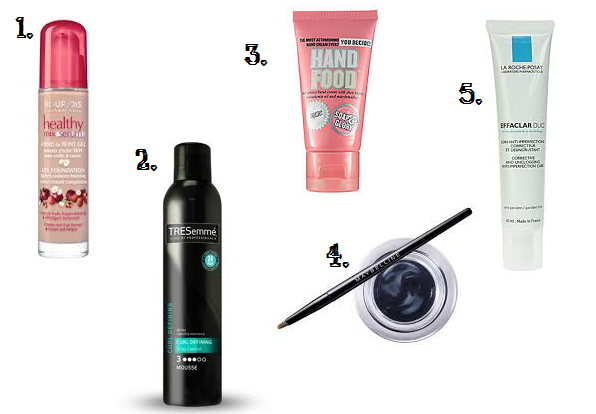 Really wanna try the Bourjois Healthy Mix and the Soap and Glory Hand Food too! I couldn't live without my S&G hand food and I have read so many amazing things about the La Roche Posay Effaclar Duo. I think i will have to try Effaclar - i've read so many good things about it! And I am so jealous you saw 1D!! I love this recipe, But I find that cooking in an oven dries out the beef too much, so I constructed my own waterbath out of empty yogurt containers and the heat of my own self righteousness so I could cook it sous vide.